You are thinking of going to Paxos? Well why not? Here are the best 11 things to do in Paxos based on my personal experiences from two visits to this wonderful Greek Island. I asked myself the question – what were my favourite things that I did on Paxos? I have put them all together here. This list is the first 11 things that I thought of, so is genuinely my 11 favourite things that I did on Paxos. I went to the Tripitos Arch twice. First time I did not find it, second time I did. Is this really my favourite place to visit on Paxos? Yes it is. I am a photographer, former climber and mountaineer and all-round explorer. I love finding new places and photographing them. I love finding natural features that I can explore and lose myself in for a few hours. And Tripitos Arch is one of those places for me. I spent a good 4 hours getting there, taking photos, clambering around and exploring the place. And in all that time I saw two people. Two people who did not speak to me it has to be said! 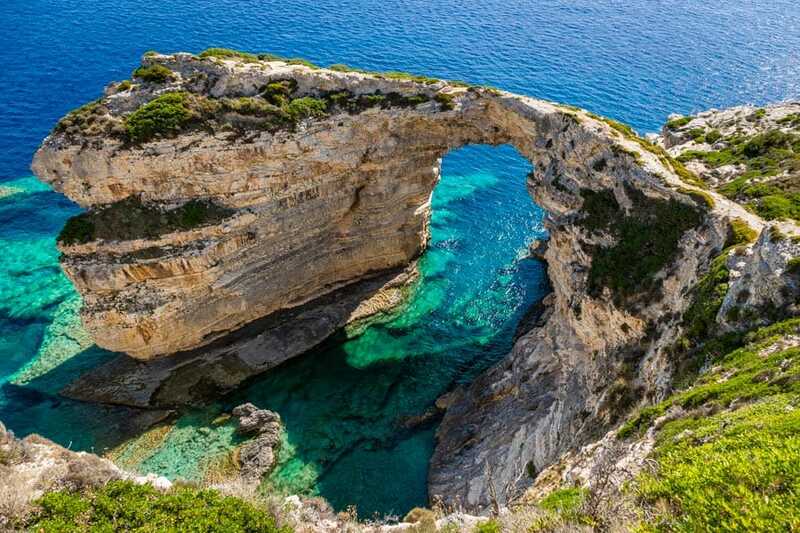 But I loved visiting the Tripitos Arch – so much so that I have written a post all about the arch and how to get there, what to see and do, titled Tripitos Arch Paxos – My Number 1 Thing To Do On Paxos – see I am not making this stuff up! The first time we came to Paxos I was aware of the Tripitos Arch, but we only stopped for a week, so I was restricted to public transport. I probably should have mentioned this on the post about the arch – you cannot get there by bus, you need either a car or taxi from (probably) Gaios. You do also pass the arch if you are taking the boat trip from Lakka down the west coast of Paxos to Antipaxos, where you get great views from the sea. This was the bit I had not thought about. Paxos is such a small island you could walk to the Tripitos Arch from Gaios. According to The Google this would take circa 35 minutes. I cannot vouch for this but have no reason to doubt Google. I never thought about walking to the Tripitos Arch from Gaios! Anyway, if you want to know more about my number one thing to do on Paxos check out the full post at the link above. And this is my number two thing to do on Paxos. Which is actually leaving Paxos! We have been to Antipaxos before, on a day trip from Gaios the first time we came to Paxos. And before that we discovered Paxos on a day trip from Corfu to Parga and Paxos, which was a trip organised by TUI. That gave us a taste for Paxos, and we knew that there was Antipaxos to be discovered! As with the Tripitos Arch I have written a separate post all about this most excellent day out. 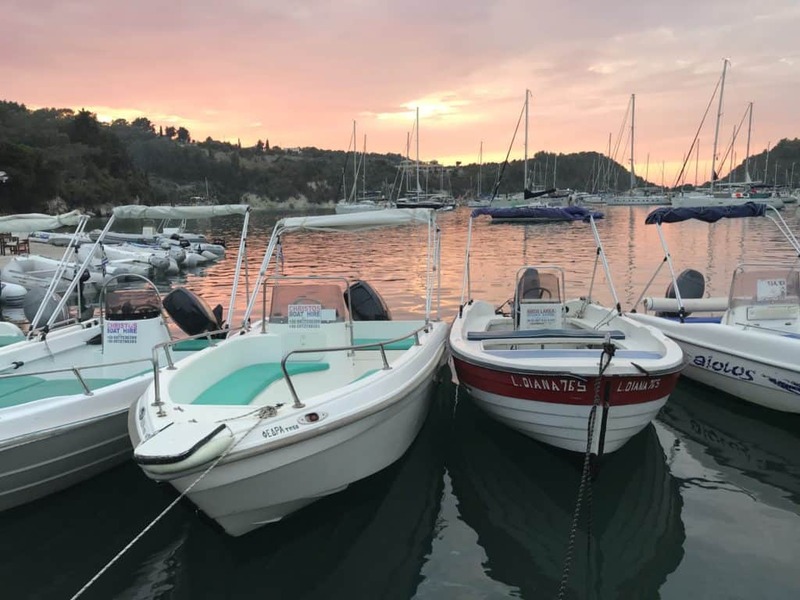 I will summarise the day in this top 11 post – this is the full post though Paxos Boat Hire – Do Your Own Trip From Paxos To Antipaxos. We rented a boat from Lakka, which is located at the top of the island. We managed to get a boat secured though Sam, our Olympic Holidays rep. That was time well spent sat at the bar by the pool at Hotel Bastas! We went to Lakka at 9 in the morning, got on the boat, had a brief lesson and then we were let loose for the day in the Ionian Sea! Here it is moored up across from Romantica – yes it really is called Lady Diana 765! I was laughing as I drove the boat out of Lakka – this was such a cool thing to do. And we got our first view of Lakka from the sea which was pretty special with that lovely aquamarine water and all the lovely white boats. The day was one of the best days ever, and we visited Antipaxos, Mongonissi, Gaios and had a few beach and swim stops on the way back. We were back in Lakka by 5pm having had a thoroughly good day, apart from me leaving my t-shirt at the bar in Antipaxos – check out the full post for the story of the repatriation of the t-shirt! 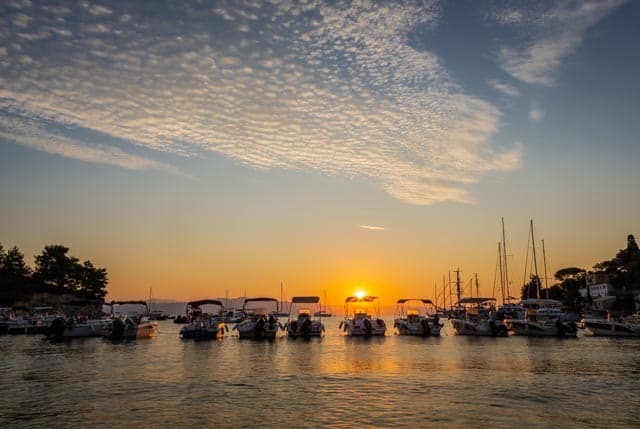 If you are going to rent a boat for a day make sure you book it in advance, and get the boat from a reputable company, of which there are many on Paxos. And get out there and have some fun! You don’t have to be a photographer to get up early and enjoy the sunrise on Paxos. I am a photographer, so of course I am going to make the effort to witness what I still consider to be the privilege of watching a new day appear with the rising of the sun in the east. And that leads me onto my first point here – you need to go to the east coast of Paxos for sunrise and the west coast for sunsets. And sunsets can be restricted by the hills, so you need to find the right location. And by that time of the day we were are normally sat somewhere lovely having drinks. You can get up early, see the sunrise on Paxos and then get back to bed and still be up at a reasonable time – it is not a killer thing to do like it is in some locations. The island is so small you are never far from a sunrise location! I photographed the sunrise in Loggos, Gaios and also the beaches on the east coast of Lakka. It is worth a recce during the day if you are going to do this, to make sure that your chosen route is navigable in the dark, and dark it can be on Paxos at night! There is no light pollution from, well, anywhere. Thankfully I have explored lots of the east coast so know where some of the good spots are. And whilst I said you can still get back for some sleep after watching the sunrise on Paxos I would recommend taking your time and enjoying that lovely, golden morning sunshine. Sure, as a photographer I would say that, but there is something special about this time of the day and that directional light. One word of warning though – be aware that there might be naked swimmers about!!! Gaios is the capital of the wonderful Greek Island ofPaxos. And it is well worth a visit. You can get to Gaios by bus from Lakka or Loggos. If you are on a day trip to Paxos the chances are that you will be arriving by boat at Gaios. And everyone travelling to Paxos gets a ferry to the New Port of Gaios. Everyone apart from all the people who arrive independently by boat and moor at the various locations around the island that is. And everyone who is a normal person who is not super rich and can arrive by helicopter or some other fancy way! There is a pretty good chance that you will pass through Gaios then, so what is there to do there? If you are arriving by ferry from Corfu or mainland Greece you will arrive at the New Port which is on the outskirts of Gaios. From the port all you need to do is walk along the waterfront until you get to the church in the square – this is the centre of Gaios. From there you can find plenty of places to eat, drink and shop. 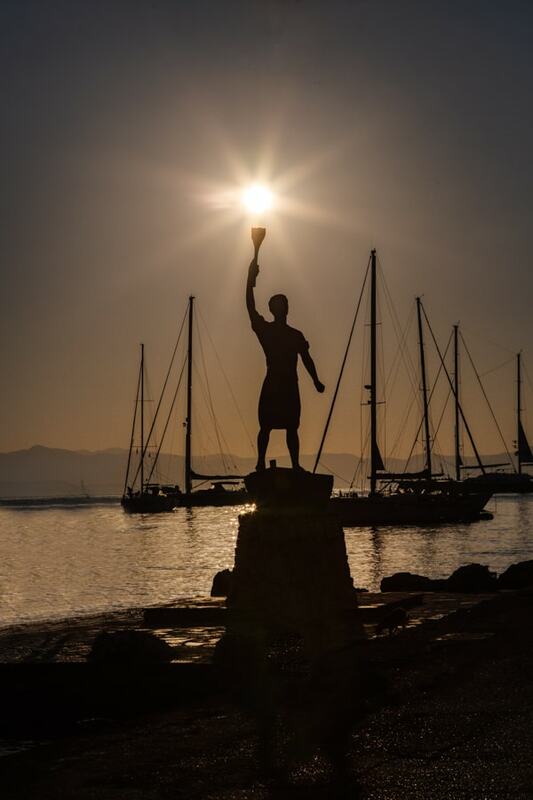 I enjoyed walking along the waterfront all the way to the Anemogiannis Monument, this photo being taken on one of my sunrise excursions. If you get the bus to Gaios from either Lakka or Loggos you get off near the main supermarket on the island. If you walk down the main shopping street that takes you straight down to the square and the church, meeting up with the route from the port. Armed with this knowledge you have enough information to explore the adjacent streets and side streets and see a lot of what Gaios has to offer. Easy to navigate and lovely to walk around. Gaios does get busier when the day trippers arrive and again when they leave, but before and after this Gaios is lovely and peaceful. And there are lots of places to eat – I must point you in the direction of the restaurant right next to the church main square which does excellent chicken gyros! Lakka is a lovely place to stay. We liked it so much there first time we went to Paxos that we returned to the same town, and indeed the same hotel, the Hotel Bastas. Lakka is a small village located at the top of the island with a lovely harbour with lots of visiting boats moored there. There is an excellent range of bars and restaurants offering plenty of places to eat and drink. We stopped in Lakka for two weeks and ate out there every night and still did not manage to dine at all the restaurants we wanted to dine at. We tended to drift down to the waterfront of Lakka circa 7.30 in the evening, and head to our favourite bar called Romantica for pre-dinner cocktails. Romantica Café Bar is just the width of the footpath away from the moored boats and has tables out the front and also an upstairs balcony which was excellent for sitting watching the sun set over the hills to the west. I think we tend to out earlier than most of the circa 200,000 visitors to the island each year, as we never had trouble getting one of the two tables overlooking the harbour! There are plenty of places to eat out in Lakka, we ended having three favourite restaurants called Taverna Pounentes in the village square, Arriva by the waterside and Restaurant Stasinos located in the centre of the village. We had lovely meals at other restaurants, but these were our favourites. There is a small number of shops to potter around after dinner before the short walk back to the Hotel Bastas. 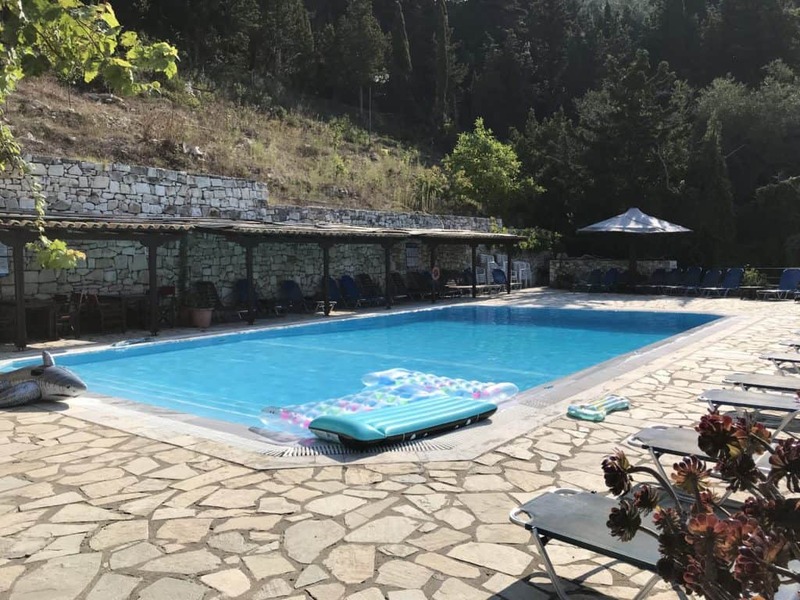 Basically, Lakka is a lovely chilled village which is a great place to stay for a fortnight if you don’t want the hassle of transport and late bars killing the mood. This is another of my favourite things to do. I have already talked about the magnificent Tripitos Arch, but there is so much more to explore on the coastline of Paxos. I have explored most of the coastline within walking distance of Lakka, which was our base for both our visits to Paxos. Doing this joined together the bits that we have visited individually which was really nice. I found myself putting together these various bits and getting to know the coastline around Lakka really well. In talking to other people, I found out that I had found places that no one else seems to have come across, which is a shame as there is so much to see which you do not read about in the brochures. I of course have an added incentive to get out and explore being a photographer and creator of websites like this one and Photos of Santorini – getting out and about is where I get my material from for my posts! And no this is not work – this is what I would do if I was on holiday anyway. All I am doing is taking what I already love doing the most and doing something tangible with it. The coastline of Paxos is lovely, and more often that when I was out and about there was no one else around either. I think that the walks around Lakka were my favourite, especially after sunrise with that lovely morning light. Paxos is a tiny island. It is actually less than 30 square miles, and only eight miles from Lakka at the top to Katsimatika and the wonderful Tripitos Arch on the south coast of the island. I drove from our hotel in Lakka to the Tripitos Arch in 25 minutes, including the time to stop and have an ice cream! True I had to walk the last bit as I ran out of road, but you get the idea of the scale of the place. I hired a car for two days, collecting it at 10am on the first morning so I could have two sunrise trips, returning the car at 10am on the second (well third) day. My sunrise trips in the car were to Loggos and Gaios. I also drove along every road I could find on Paxos exploring the less well visited parts of the island. And that was the best time – me out on a Greek Island with just me and my camera in the car exploring and taking photos. One of my favourite things was driving up to the very top of the island, where I found a convenient parking place and managed to get to the hills overlooking the entrance to the harbour at Lakka. I did not know at the time, but I could have walked there no problems – I am not sure I would have worked this out in the limited time I had available without the car. Driving all the way down to Mongonissi was good, calling in at Gaios on the way back to Lakka. I could have explored more to be honest, but two days was excellent fun, even in a Peugeot 108! 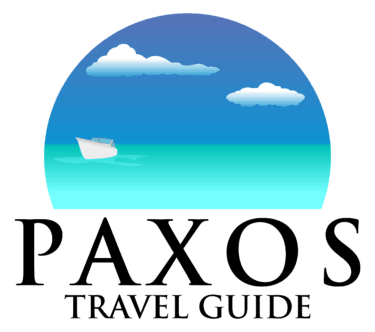 You can read more in this post titled Paxos Car Hire – What I Did In 48 hours – days 12 and 13. There is one bus service on Loggos. It goes from Lakka to Loggos to Gaios. We got the bus one morning, getting the 11am service from Lakka. It was a good 30 second walk from the Hotel Bastas to the bus stop. We had leisurely snacks in Lakka before getting on the bus and enjoying the elevated view from the front seats. Whilst the bus is only a single decker the seats are significantly higher than in a car giving you much more to look at. I saw things from the bus that I have not seen before, or since, which is good. And sitting in the front gives obviously the best views looking forwards as well as the but drops down into Loggos for the first stop. After a short wait it is time the highlight of the bus trip – well it is the highlight for me anyway. And no, I have not taken a video of this marvellous scene, which I really wish I had done. The bus from Lakka to Gaios driving along the harbour side in Loggos. There is barely room for the bus which is so close to touching the tables where people are sat eating and drinking! It really is a fantastic thing to watch on the bus, where you get the feeling that you are going to tip into the water at any second, and also from afar safe on the land. And no there is no room for traffic coming the other way – all you can do is wait at the top of the hill for the bus to go past. The rest of the journey to Gaios is rather uneventful in comparison! If you are on Paxos get the bus – you will not regret it I promise you. Drive from Lakka down to Gaios, and not long after the turning for Loggos you arrive at the village of Magazia. In this very small village is Averto, a cocktail bar that serves lovely food. Magazia is located pretty high up in the centre of the island. Averto has an outdoor seating area at the back that gives lovely views of the island and the sea not that far down below. We sat there for quite a while drinking a lovely coffee each before enjoying a delicious cooked breakfast of poached eggs on toast. I could have stayed there much much longer. While we were there I went to the loo and took a photo of this wonderful wash basin! Whilst we were in Magazia I had a quick explore of the village, which as I said was tiny, before returning to collect M (as she likes to be referred to having read another post!) for our onward journey down to the south of the island. Talking of spending a day somewhere that is just what we did when we went to Manadentri Beach. This beach is located on the east coat of the island and is the next beach down after Orkos and Lakkos beaches. You need a car to get to this beach, or a taxi. Or if you are stopping at Hotel Bastas they take you there and pick you up again later for nothing! Which is exactly what we did. You have to walk through a bar to get to the beach. At the bar you are encouraged to take a table and eat and drink with them. Not that there is anything wrong with the ΜAΝΔΕΝΔΡΙ Bar and Restaurant, but it can get noisy with lots of families there. If you like something quieter then let me tell you a secret – promise not to tell anyone ok? If you walk through this bar, get to the beach and turn right you will come across the restaurant at the Glyfada Beach Villas and Restaurant. Anyone is more than welcome to eat and drink there – that is not the secret. Above the restaurant there is another bar, and a pool overlooking the beach. Ask nicely at the restaurant and they might just let you use this very nice swimming pool in a fantastic location. Remember – keep this between us – don’t tell anyone! 11 – Days doing nothing relaxing by the pool. This was probably my favourite thing. A day of doing nothing. Or in our case days of doing nothing. We came to Paxos to relax and unwind, and that is one thing that you can do effortlessly in Paxos. We stayed at the Hotel Bastas, which is located a very short walk from the water in lovely Lakka. Hotel Bastas is a lovely family run hotel which has a real gem of a swimming pool which is located behind the hotel and unusually above it. This elevated position gives the pool extra time in the lovely sunshine in the evening. Down in Lakka the sun sets before it does at the pool due to this elevated position. The pool is open at 9 in the morning and has a bar where you can get food and drinks all day. There are plenty of sun loungers, chairs and shaded seating areas – plenty of room for everyone. There are also loos and showers underneath the pool. All of this loveliness is accessed from a fantastic bridge across from the main hotel. This was where we spent quite a few days doing nothing – it was the perfect base to unwind. I know it is a long way to travel to do nothing, but this is the kind of relaxing that you cannot do at home. Here by the pool we have no need to go anywhere from the moment we get there until it was time to go out in the evening. The fact that we know that we can spend the whole day in one place without any effort and relax and chill was one of the many reasons why we returned to Hotel Bastas. Paxos is a small, quiet, relaxed Greek Island – embrace and take it easy! And get to know the island. It is so small it is easy to explore all of the island in a couple of days, and considering the island gets circa 200,000 visitors a year I was surprised how easy it was to find deserted roads, churches, olive groves and beaches! And there is also Antipaxos to add to the mix to what is a wonderful Greek Island well worth a visit for a day, a week or a fortnight. Previous PostPrevious Did We Discover Paxos Greece? Yes, But Now it’s Time To Go!